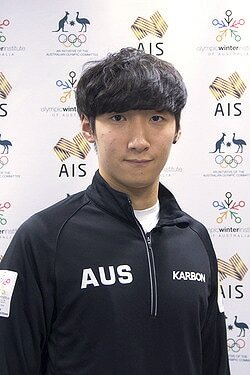 Born in Korea, Hyun Woo (Andy) Jung, had tried short track speed skating before moving to Melbourne, Australia with his family where in 2012 he became serious about his sport. At the 2013 Australian Open Championships, Jung recorded two third places and a fourth to qualify for selection for the 2013 World Cup circuit. He also became an Australian citizen. Ice Racing Australia (AIR) acknowledged his swift rise in the national ranks in 2013 the Outstanding Achievement Award at their Annual Awards night. In November 2014 Jung recorded a then personal best World Cup performance of 18th place in the 500 metres at the World Cup event in Montreal, Canada. He also made his World Championship debut in Moscow, Russia, placing 28th in the 500 metres. Competing in his second World Championships in 2016, lifted his 500m event PB to 21st and again in 2017 to 15th place. The 2016/17 season was another step up the ladder with a 14th for the 500m World Cup in Shanghai and a PB best time for the 1000 metres of 1:26.703 in Salt Lake City, USA. Jung finished the 16/17 season with a 15th in the 500m at the 2017 World Championships. He won all three distances (500m, 1000m, 1500m) in the 2017 AIR World Cup Trials in July 2107. Jung made his Olympic Games debut at PyeongChang 2018, competing in the men's 1500m and 500m short track skating. The Korean born skater advanced to the semi-final of his opening event in the 1500m after it was ruled by the judges that he'd been disadvantaged by a collision between other skaters in the heat. A 5th place finish in the semi-final proved to be a strong start to the skater's Olympic debut. I began my sport when I was six-years-old after skating with my family in Korea. I enjoy my sport because it’s competitive – a race. You don’t know what’s going to happen. Favourite international competition: Olympic Test Event in Gangneug 2017.